The show and especially its catalogue were already reviewed here, but several subsequent events have enriched the impact of the show. 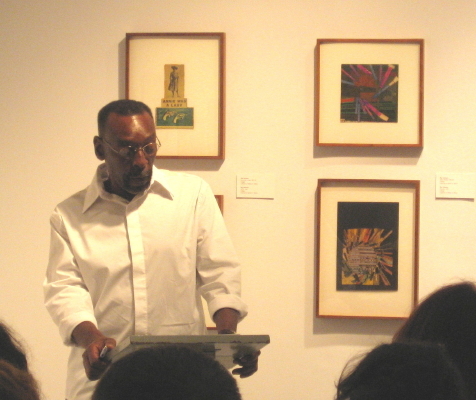 Dr. Francis F. L. Beatty (quoted and seen above), a curator who works with the Ray Johnson Estate, gave a lecture at the BMCM+AC on May 21, using parallel slides to show that Ray displays elements in his collages that link him to the major artistic trends of the day. His wit, humor and intense communications of all kinds were highly stimulating but hard to classify, but his collages and the palette he created out of found and encountered material can be seen as fully in the tradition of Klee’ as well as Albers, while partaking of the humor of Dada. “I don’t make pop art. I make chop art.” Ray’s statement refers to his use of old work in new, and Dr. Beatty skillfully elucidated the way in which Ray’s “chop art” (often meticulous geometric constructions) came right out of his Black Mountain experience. She makes a point that reverberated through this show: the liberation of American education happening at Black Mountain served as well to “liberate Ray Johnson.” He found himself, and he found the principle that best illuminates the breadth of his work for me: images standing in for words, words become imagery. 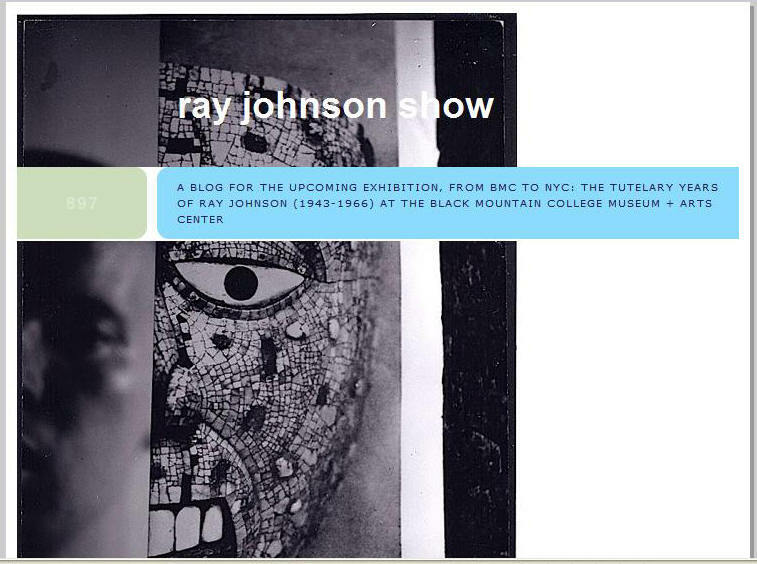 Yet Ray remains enigmatic. 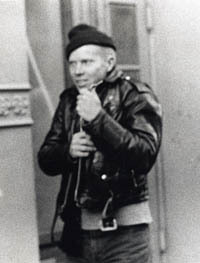 Dr. Beatty spent much time on the 55 Moticos – huge intricate collages – which Ray made and destroyed, calling them “some of the earliest and most significant examples of Pop Art.” She recounted many personal interactions with Ray, such as the time he approached her and finally wanted to do a gallery display – of “Nothings.” Beyond his inscrutability, his avoidance of the commercial process, Dr. Beatty makes a simple but important point – the small scale of Ray’s visual work limited his gallery prospects and indirectly his artistic stature. The scale of Ray’s imagination and willingness to live his life for art was unbounded, of course. The final night of the show, orchestrated by curator Sebastian Matthews, was a truly wild and wonderful event that did much to reflect Ray’s spirit. Music, poetry, and spoken word all filled the space. “We have to seize the things we need to create.” These words were spoken in Picasso’s voice by Keith Flynt, one of the closing night performers (seen below). 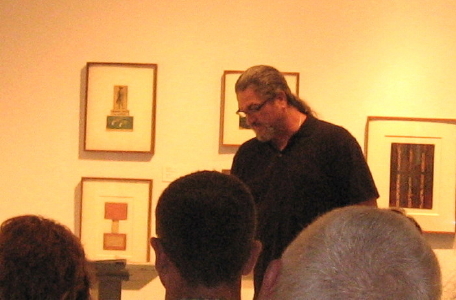 Earl Bragg, seen above, offered a nine-eleven poem that featured number names – worthy of Ray’s glyphs and puns. His political themes and passionate phrases made for an excellent reading. 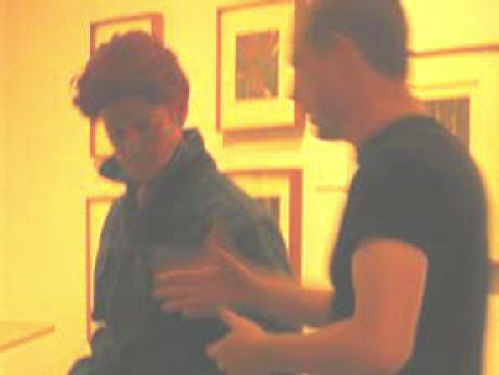 Local dramatists staged a reading of a collaged piece incorporating Ray’s play inside a play about Ray discussing a play with pink James Dean. The Ray show is dead, long live the Ray show. Looks like it was a great art show! Beautiful. Thank you for this. Can you please take a look at the project A BOOK ABOUT DEATH, inspired by Ray’s work and exhibited at The Emily Harvey Foundation Gallery in NYC (September 2009). 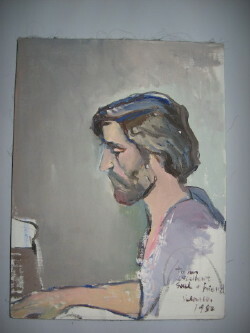 Thanks for this… Arthur Secunda, a friend of Ray’s from high school pointed it out to me.